Today, Gov. Rick Perry announced that California-based commercial space-travel startup SpaceX had reached an agreement to build its first commercial spaceport and launch pad in Texas. The deal included a generous incentive package worth $15.3 million to make it happen. SpaceX will build a control center in Cameron County, Texas, with a launch facility in Brownsville. 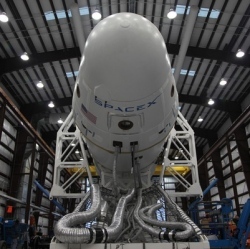 The city’s local newspaper, the Brownsville Herald, indicated that SpaceX expects to launch 12 orbital rockets per year. Perry’s office indicated that discussions with SpaceX had been ongoing for years. In fact, CEO and founder Elon Musk even suggested that Texas would be the site of its spaceport during a keynote discussion at SXSW event back in 2013, as VentureBeat previously reported. “Texas has been on the forefront of our nation’s space exploration efforts for decades, so it is fitting that SpaceX has chosen our state as they expand the frontiers of commercial space flight,” Perry said in a statement.